A STRANGE and unnatural thing happened to me on Tuesday night: I saw the cricket wasn’t on TV, and I groaned. WITH DISPLEASURE. It’s true that I was watching Mark Burnett’s The Bible at the time, so I could probably be forgiven for this sudden slip into sports-appreciation. Watch God smite Sodom and Gomorrah with CGI special effects for long enough and even the most ardent sports avoider will start praying for some man-onman action. So to speak. It was Thursday night. I’d just completed the fifth cycle through of the TV channels to determine that nothing good was on - the equivalent of opening the fridge and staring into it, hoping food has appeared since the last time you checked. Suddenly my finger slipped and I found myself watching what appeared to be an incredibly dull movie set in a park, where everybody wore the same costume and nobody said anything. ‘‘Wow, Kath and Kimderella really is as unfunny as everyone said,’’ I thought, before realising I was, in fact, watching the Ashes. But here’s the strange part: I didn’t turn it off. To clarify: I saw cricket happening on my television, and I didn’t automatically change the channel. The last time I remember actually watching cricket was about 10 years ago when my mum was writing a book about it, and as I was living with her I was forced to watch every minute of whatever match was on. since forgotten how to make. Man, I loved that sandwich. As I found out later, pretty much no one had ever heard of Ashton Agar, so I wasn’t as clueless as I thought I was, which made me feel even better about my new found cricket appreciation. I was riveted, captivated, tense on the edge of my seat ... and then they called lunch and everyone wandered off and the commentators started talking about the weather. 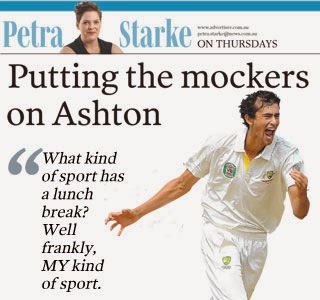 What kind of sport has a lunch break? Well frankly, MY kind of sport. I respect a game that allows for a civilised break for tea and sandwiches. Mmm, sandwiches. The only problem with this civilised break is that it came about 10pm Adelaide time, which is not only a highly inappropriate time to eat lunch, but a terrible time to have to watch an empty lawn for 40 minutes when what you really want to do is see Australia win and then go to bed. My new interest in the sport didn’t quite stretch to that level of commitment, so I retired to the bedroom intending to catch up with the news in the morning. So we lost the first Test. So basically, I took an active interest in the cricket for the first time in well, ever, and immediately it all went to hell. I know you cricket fans are a superstitious lot, so you might as well blame me. I’m fairly certain it’s my new interest in the sport that’s jinxed the team. Maybe I should start supporting England?